This will be a restaurant review in a moment, but first a couple of words about upcoming videos. (Or skip to the second photo below.) It’s been nearly two months since the Hoosier Mama video, but your Sky Full of Bacon correspondent has been busy and two, count ’em two, pieces should be up shortly, both of which, oddly enough, involve subjects skirting the edge of modern American food safety bureucracy. The first, which should be up later this week, will be kind of a cool collaboration with my buddy David Hammond, who does little audio documentaries about food for WBEZ. In this case, David was interested in non-aged raw milk cheeses, which are illegal in this country because of supposed health risks (which somehow manage not to kill millions of Frenchmen every year), and he connected with a woman named Coleen Graham who makes raw milk cheese at home. (I hasten to point out that Coleen does not sell cheese, raw milk or otherwise; she just makes them for consumption amongst friends, which is legal, assuming you buy the raw milk in a neighboring state where it’s legal.) So David invited me along to Coleen’s house in November to shoot the process of making cheese at home. That’s as far as my video goes, but a few weeks later we went to a wine bar in Itasca to taste the cheeses and see if we could tell the difference between raw milk and pasteurized camembert, and so you’ll be able to watch the video, and then get the rest of the story from David in a radio piece on WBEZ’s Worldview next Monday, February 15th. UPDATE: moved to February 22. The second is, as promised at the end of the last video, a remembrance of Healthy Food, the last surviving Lithuanian restaurant in Bridgeport. 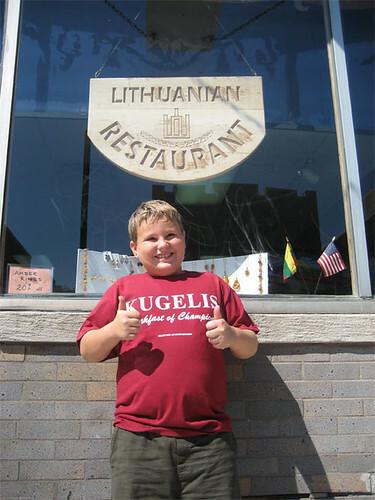 Lithuanian Chicago is little remembered today, but at one time (c. 1920s) there were more Lithuanians in Chicago than in any city in Lithuania, and Healthy Food, which opened in 1938, was the oldest surviving Lithuanian restaurant in the world. Healthy Food was one of the places on my mental list of places I thought about doing a video about someday, so when I heard that there were closing within the week last December, I raced down there and basically camped out for a couple of days, interviewing the owner and staff and— this was the coup— filming the making of kugelis, the baked potato-bacon pudding that is Healthy Food’s signature dish. Why was this a coup? Well, let’s just say that there are certain old world cooking practices involved which the owner said she didn’t let previous camera-toting visitors like Steve Dolinsky film, for fear of attracting unwanted Health Dept. attention. But since she was planning to close in a few days anyway, she said what the hell, and so I document the making of kugelis in all its pre-modern glory. If the result frightens you… well, it’s closed anyway, so you not only don’t have to eat it, you can’t. Reading the one LTH post by Rene G, Seklycia sounded elderly bordering on sepulchral, its entrance disguised to the crime-ridden neighborhood around it (note his photo of the sign cryptically promising “Lithuanian Human Services”), a buzzer allowing admittance to the few who know. I envisioned the last, preserved-in-amber holdout against the waves of change that had integrated Marquette Park in the 1960s. Marquette Park’s place in the turmoil of the 60s is usually depicted one-dimensionally, Martin Luther King versus white racists, but I could certainly imagine sympathy for the ethnic immigrants who had created a little neighborhood of their own in pursuit of the American dream, only to see bigger historical forces blow it away. (I mean, it’s not like Lithuania has any history of being wiped off the map or anything.) It seemed as if I was coming to the most obscure restaurant in the most obscured ethnic enclave in Chicago, and I fully expected a cobwebbed, funny-smelling grandma’s house atmosphere to match, like Zakopane or the like. In fact, Seklycia is nothing much like that at all. The cryptic sign is down, replaced by the jaunty message above, and there’s no bell to ring to go in. (The neighborhood doesn’t seem bad at all, frankly— mostly daycare centers.) The dining room could be any modest cafe in a small town, and a waitress several decades below 80 cheerfully took my order as modern American pop music played on a tinny radio. Figuring this was likely to be my one shot here, I ordered the $7.99 Lithuanian combo. It started with bread, continued with a huge bowl of beet soup (which tasted a bit French oniony, as in, there might be a package of onion soup mix in there) accompanied by a boiled potato, and then— I was nearly full by this point already— proceeded to a massive plate of kugelis (fluffier than Healthy Food’s, quite good), sausage (overcooked and not that interesting; definite win for Healthy Foods here), sweetish sauerkraut (just fine and improved the sausage immeasurably), and a terrifyingly large “zeppelin,” a big wad of ground pork meat inside a 3/4″ football-shaped shell of gooey potato dough, which I could barely face at all— it was like some form of mutant dim sum. Lunch concluded with tapioca pudding, which I enjoyed shamelessly. All in all, the meal was just fair, and not a replacement for Healthy Food, but clearly there are at least some good things on the menu. It was when I went to the bathroom that I discovered that in fact my original preconception of Seklycia wasn’t entirely wrong— the next room was the grandmotherly holdout against history that I had expected the whole restaurant to be, with old ladies playing cards or knitting at tables and, interestingly, a “Bibliothek” full of Lithuanian books. I no longer saw it as sad and a bit gothic, though. As the sign says, Seklycia is about 20 years old— which means it’s really not a remnant of the old Marquette Park community but a new business, relatively. Someone saw the neighborhood as it was in the late 80s, long after all the turmoil and the “white flight” and the irreversible emigration of Lithuanian Chicago to the suburbs, and still had faith enough in it to open a restaurant and make it a kind of center for what community remained. 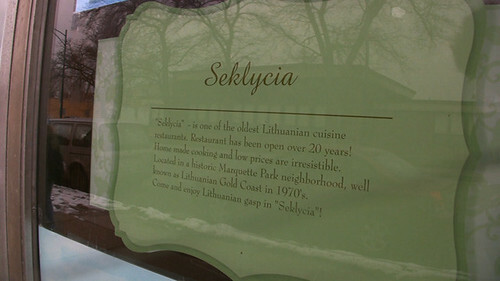 I find that kind of heroic, and if you ever find yourself in that area, or feel like making a trek to an obscure corner of the south side, you could do worse than to offer Seklycia a little support— and, as the sign says, enjoy Lithuanian gasp. Can’t wait for the Healthy Food piece so I can learn a little bit more about a little piece of my own heritage. My Lithuanian grandma was just telling me a couple of weeks ago about making kugelis, which I’ve never tasted. I’ll most definitely share your video with her when it is posted. Downstate here, in the Champaign-Urbana area, raw milk from cows, goats, and sheep, is all readily available. Why no pigs’ milk is still one of those great, unexplained cosmic mysteries or injustices. I’ll have to go back and look at the raw footage, I swear the woman who made the cheese told a story about it being illegal here and she had to go to Wisconsin. I’ll check what she actually said. My understanding is that pig milk is fine but pigs 1) don’t produce enough at a time and 2) don’t sit there placidly to be hooked up to a milker like cows do. So that’s why it doesn’t exist on a practical basis. I know people are all excited by thoughts raw milk being better for you, but please do keep in mind that there are definite dangers to consuming raw milk (or pretty much any raw animal product). The CDC’s most recent report cited of food illness reports linked to dairy (which granted are less than chicken/produce), 71% of those were from raw milk products. If you don’t believe the big bad government, have lunch with a microbiologist. Louis Pasteur was on to something 100-plus years ago for a reason. Louis Pasteur’s world also didn’t have modern refrigeration on a wide-spread scale.